partnering with a growing number of large and small galleries, museums and picture libraries worldwide, in particular with Bridgeman Art Library and Cabinet UK. On the Artfinder website, consumers can create their own personal ‘art gallery’, collect their most-loved artworks, and share them with their friends via Facebook, Twitter and email. Additionally, Artfinder’s innovative ‘magic tour’ helps consumers discover art whilst also exploring works that are recommended by friends and passionate experts. Options for interacting with the site include an Art Shuffle option and the aforementioned Magic Tour (although the ‘choose your favourite’ images that the tour used to decide which path to send you down seemed a bit limited in range, and I wasn’t actually very excited by the art I was recommended – but the idea was fun). Each work of art on the site links to its originating gallery, and can be shared via Twitter or email and ‘Liked’ on Facebook. On the bottom of each work of art, there is a discussion question (How does this make you feel? What do you think about this artist?) which again links to Facebook. 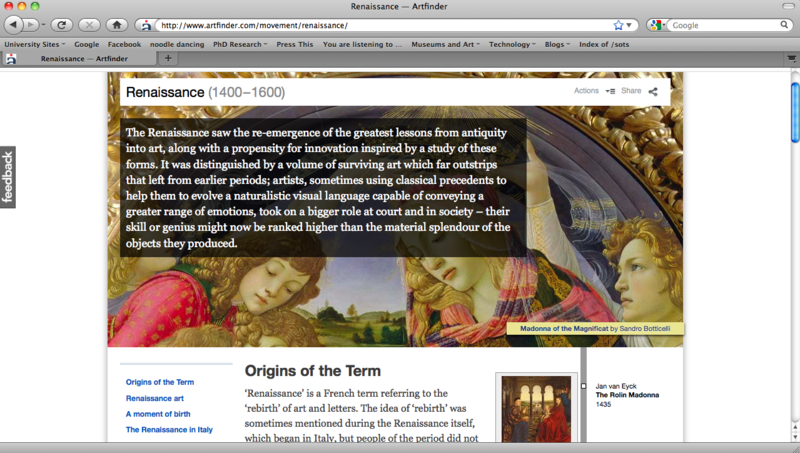 And in the Art Guides there are short descriptions of art movements, like the Renaissance (below). But I think the really interesting thing about the site is that the works of art have been commercialised, with visitors given the opportunity to buy a copy of the artwork. According to the stats on Mashable, the Gallery currently has over 500,000 works of art, and has partnered with about 6,000 galleries, and this gives those galleries an interesting new opportunity for gaining a bit of commercial profit for merchandising – not to mention a new way to find out which works of art in their collections are the ones that people really want to buy. Imagine if the Bridgeman Art Library discovers that hundreds of people all want to buy one work of art they’ve never even considered merchandising… it could be a pretty interesting way to get some market research on the demand for merch for the collection. One of the co-founders of the website used to be COO at Last.Fm, and I think that there are some obvious cross ideas at play conceptually… the notion of discovering and sharing art in this context isn’t too far from the idea of musical discovery on Last.fm. But unlike Last.fm which has a lot of great current and contemporary music on it, most of the art currently on Artfinder seems to be from a previous era (one where copyright has lapsed, I imagine)… The page on Postmodernism doesn’t seem to include any links to art – although some key artists are profiled – and there seems to be little discussion taking place about what’s happening within current art conversations. This is something I think could make the site more interesting, and is no doubt something that will come with time. So what do I think of it as a site? Artfinder has some cool ideas, but I do think it is missing the expertise and authority that museums can and should have. I don’t necessarily trust the Artfinder brand to teach me about art in the same way I would a more established museum (rightly or wrongly). The site still operates as a silo. It might link works of art across lots of galleries – which is cool because it brings together disparate collections into one place – but the information contained on the site seems to be entirely derived from within, rather than linking to external information sources and leading to a more interesting and serendipitous journey of discovery. There also doesn’t really seem to be much narrative accompanying the site/works, and it would be nice to have great sense of a story when looking at interesting art. I’d be interested in hearing other people’s thoughts on the site. Have you used it? Would you use it? Did anyone see their demonstration at MW2011? And if so, what impressions did you get? 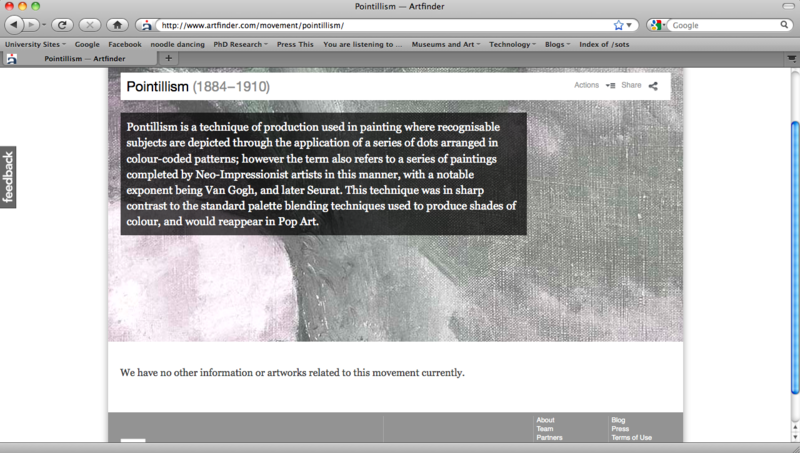 I found the same, the website did not show me anything i liked and so to me it failed in being LastFM for art. I am surprised how much buzz this website is actually getting. Yeah – I think the buzz comes in part because there is the pitch about it being Last.FM for art… it’s the marketing equivalent of taking a product that already exists and putting a clock in it – or in this case, taking a guy who has worked for LastFM and turning his skills to art. But I guess the bigger question is whether the buzz can become a more sustainable noise. And if you and I are representative of the people who have visited the site and neither of us have really connected to the art that’s on it, then I would guess it’s going to have to work a bit harder to do so. I am an artist and when I saw the site I enquired about becoming a contributing artist. This was weeks ago. Yesterday I received an email asking me to join. I’m a little hesitant because I’m in the US and this originates in the UK. I’m concerned about taxes and licenses and all sorts of legal mumbo jumbo I have no idea. Does anyone know someone who is part of this site? Is anyone reading this a part of this site. I’d like more information about it that doesn’t originate from them. “following” each other, as artists have the option of promoting each other’s work. I just happened across your article while researching the service, as an interested artist. I have already “applied” to be represented there, however I find your commentary cogent and interesting. Thanks. I’ve just been invited to join, so I’m here to see what people are saying. It seems to me that individual pieces of art get buried at these sites. Still, I’m encouraged by your comment, Jon, that your friend has purchased items and is pleased with them. In the email they sent me, it was stated that I was responsible for all stock, and, if I read it correctly, the sale is handled by them. They take a 30% commission, which seems fair considering that brick and mortar galleries must take 50% to stay in business. On other art websites, I’ve found that my art is lost in the mob, but Artfinder has been a very different experience. My art has been featured in a few newsletters. There is also an opportunity to apply for “Art of the Day” by writing a brief description of your art. I tried doing this and was accepted. Also, artists can promote each other’s art, if you would like to consider doing so. Does anyone know how much it costs to have your work on Artfinder? I have been an artist and photographer on ArtFinder until recently. Whilst I managed to sell a few pieces, I also have to report that I was very unhappy with the service. The organisation pretends to value ‘good quality art’ as defined by their staff or curators but there is little evidence to show that these people have enough experience to be the arbiters of good art. This comes across with their heavily promoted selections distributed to contacts supplied by each artist. Whilst this method brings your work to the attention of all your contacts along with whoever discovers and likes your work and elects to follow you on the gallery, there maybe occasions when you don’t want particular work to reach particular people. There is no control of who receives what and I experienced dissatisfaction from some of my friends and colleagues who felt annoyed or even intimidated by the number of promotions by email, twitter or other social networks. Amusingly much of this can find its way into people’s spam box or junk email. It is obvious that the powers that be at ArtFinder are running primarily a business which happens to be ‘ART’ but I agree with some comments on here that the entire operation does not inspire confidence…it is all rather shallow with little depth of knowledge to underline their passion for ART in all its forms. ArtFinder is a DIY display facility mostly for amateur artists and housed in a giant virtual warehouse. I must also point out that they run a very strict and controlling agenda for all artists with rules that may be too restrictive for some including myself. The forum for example can only be used by ‘nice’ polite people who do not agitate the community with disparaging or offensive comments. Yet when I tried to defend myself against several offensive comments from obnoxious people on the forum or suggest ideas that did not fit the ArtFinder ideal, I was banned from using the forum without so much as a polite warning. I think ‘Freedom of the Press’ and tolerance still has to reach the policy makers. The juried entry is misleading. The only this they are looking for is that the artist has the proper quality of images. I have made two accounts. One for myself (student level/ lower price range) and one for my mentor & boss (A 40 year professional with higher price range). While I made one sale the day I launched my page his has not. Which was to be expected because of his price point. We understand there would be slower movement. I think the way shipping is handled is ridiculous as the price of shipping varies based on size and distance. So If your timetables aren’t perfect or your customer doesn’t contact you inquiring about shipping so you can recreate a proper shipping table for them your SOL if you don’t have the proper amount listed. If you guess too high you’re able to refund your customer, but if your estimate was too low you just have to eat the difference. Not to mention if you guess a higher estimate you’re likely to scare your potential customer off. Everything that suggests the word SALE will bring people in… It doesn’t feel like an art venue. It feels like a craft venue or place to sell reproductions. It basically almost feels like an etsy version of an online gallery. Let me also point out for a site that doesn’t promote your work but is willing to take a percentage of the sale why on earth would WE promote the site itself? If that’s the case we want customers to buy directly from us so we can have the entire slice of the pie we worked our bums off promoting. They also suggest that you can increase your sales by interacting with the Artfinder community. Follow for follow? While I think its really encouraging and kind to see people liking the artwork… I don’t really see how that should affect your sales. To be honest, I’m losing interest.. but will leave the works up on both accounts in the off chance someone randomly bites somewhere along the way. The commission is still better than what galleries are doing these days.. but I’m not going to go out of my way to promote them to bring buyers to purchase works through them vs. directly from me.